Creating a fully functioning knowledge base, that helps to engage your customers and answer their questions, is a difficult process. A successful knowledge base should be user-friendly, and contain extensive information that when searched can quickly help solve visitors’ problems. It should also provide motivation, inspiration, and opportunities for customers to learn. 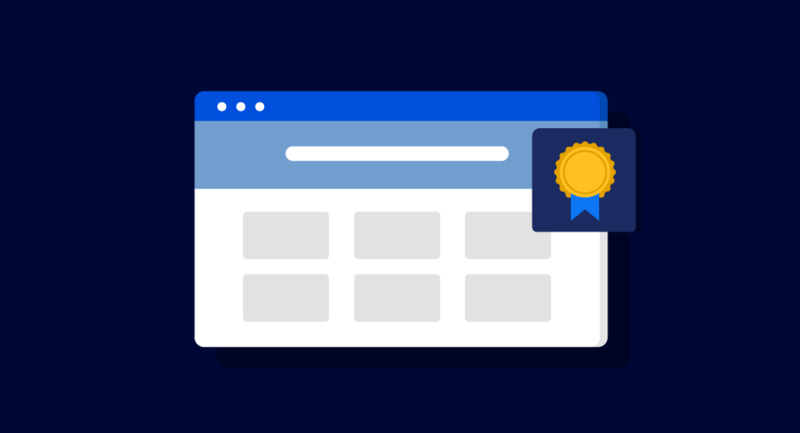 In this article, we look at ten of the best knowledge base examples currently in use, and discuss what features make them so great. By the end of reading, you will have a plethora of ideas and examples to use, helping to inform the creation process of your knowledge base. The Squarespace knowledge base homepage is attention-grabbing in its full-screen background image, and large search bar. A bold menu also lays out the help options, including Help guides, Videos, Webinars and Workshops, Forums, and more. This strong layout clearly signposts what is on offer and where users can go to find the information they need. 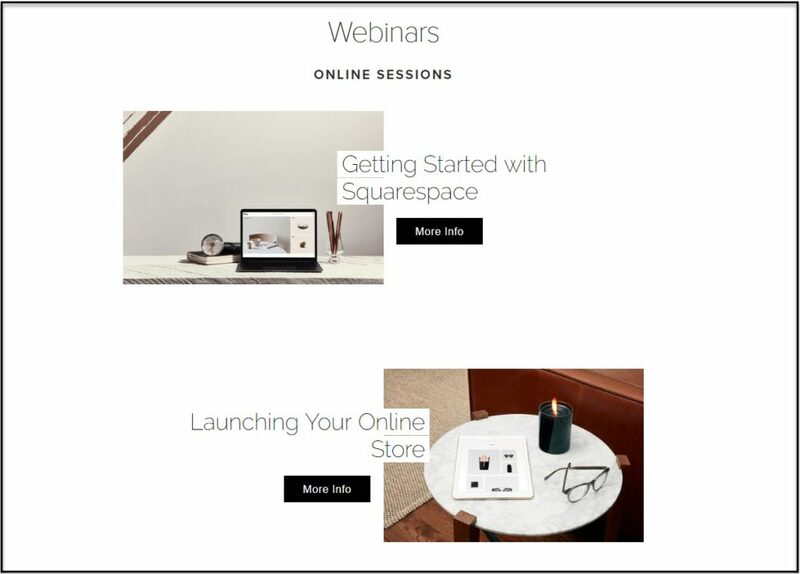 Squarespace provides live webinars that people can register for and take part in. Each webinar works through a subject, for example ‘Getting Started with Squarespace’ or ‘Launching Your Online Store’. Webinars are an hour long and Q and A is available throughout each session. This is a resource for those who learn better through watching rather than reading, and an impressive component of the Squarespace knowledge base. The Squarespace video collection provides a wide assortment of video tutorials for users to view in their own time. Divided into categories, each video provides tips and tricks for getting the best out of Squarespace. Again, these visual walkthroughs are perfect for those who would rather watch a video than read. Help Guides – Help guides are divided into clear categories, helping users to quickly find the info they need. Hire an Expert – Squarespace offers the service of connecting users with Squarespace design experts. Call-to-Action Button – On every page of the Squarespace knowledge base you will find the call-to-action button ‘Start a Free Trial’. This will encourage anyone reading up about Squarespace to sign up, helping to increase conversions. The main lesson to be learned from the Squarespace knowledge base is the importance of using different media. Webinars and videos, alongside guides and articles, help cater for the needs of all learners, ensuring that Squarespace isn’t alienating a particular faction of their customer base. 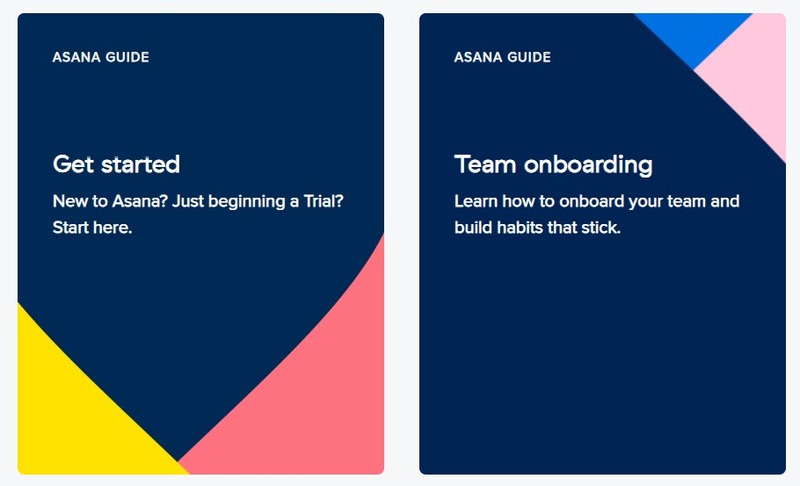 To get the most out of Asana, an extensive project management tool, users need to understand what features are available, and how to use them to their advantage. Therefore, the Asana knowledge base isn’t there to just deal with any problems or questions users may have, it is there to educate and teach best practice for using this tool. The homepage of Asana’s knowledge base immediately points users in the right direction. Articles and tutorials are separated into three groups, depending on your experience of using Asana. Therefore, companies that are trying to expand their use of Asana don’t have to sift through the same content as that of a beginner. Asana provides short, easy to follow, lessons for beginners. These lessons come in the form of visual popups, and help run through how to set up and organize tasks, manage a team, and more. This is an effective way to onboard new users and help them hit the ground running. 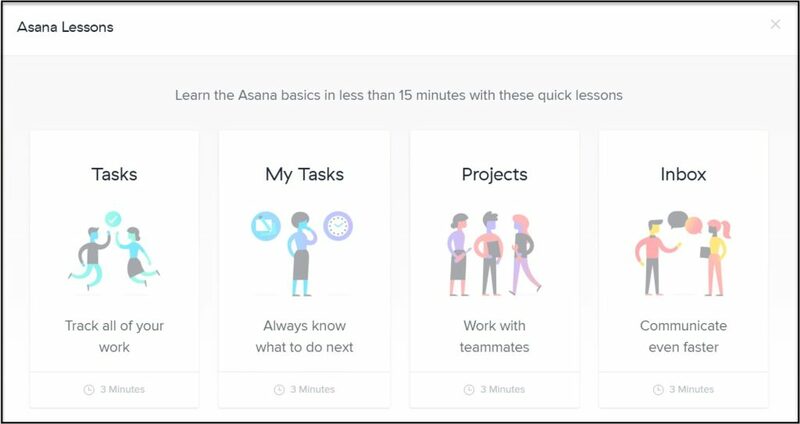 Asana Academy – Users can improve their Asana skills via a selection of tutorials that incorporate videos, quizzes, and challenges. Common Questions – Asana provides a list of common questions, so users can quickly find answers to everyday queries. Asana YouTube Channel – Asana shares weekly tips and tutorials on YouTube to help coach existing users and attract new potential customers. As you can see, there is much to learn from this knowledge base. From the organization of large amounts of information, to the user-friendly teaching materials, Asana consistently ensures this knowledge base adds value to their customers’ experience. Wix provides an extremely well organized and uncluttered knowledge base, that immediately fills users with confidence that they will easily be able to find the information they are after. The Wix knowledge base homepage features a center stage search function. This enables users to quickly search a question or topic, helping to solve their problem in the minimum amount of time possible. The search function also provides automatic suggestions for those users who aren’t quite sure on what they are searching for. Articles are organized into categories, making it quick and easy for users to find the exact article they are searching for. Each category is also sub-divided, ensuring users aren’t overwhelmed by the sheer amount of content once they select a category. Trending Topics – Wix provides a selection of trending topics on the knowledge base homepage to help visitors find information on popular subjects. Wix Blog – Wix regularly posts a range of articles discussing best practices, top tips, inspirational examples, and much more. Wix Stories – Real Wix users share their stories, experiences, and ideas for others to learn from. The Wix knowledge base has many impressive take-away features. As well as the clean and organized design, Wix has carefully considered what information is most important to their customers, and has displayed those articles at the forefront of their knowledge base. Fitbit displays their range of products on the knowledge base homepage, which provides great visuals. Users can then click directly on the product they need help with. This ensures the customers get the right help with the right product straightaway. 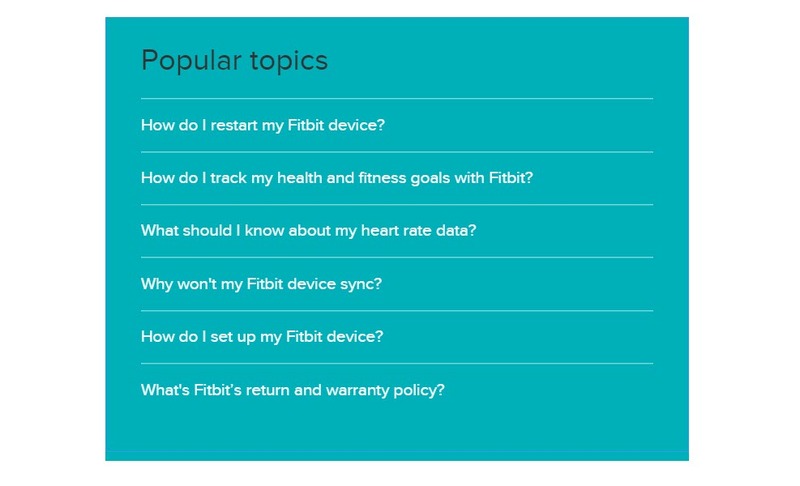 On the Fitbit knowledge base homepage, Fitbit lists a number of Popular Topics. This enables customers to quickly find answers to common generic questions that are not device specific. Get Support – Users can find a link to the Fitbit support page on the homepage of the knowledge base. Product Help Forum – Users can ask for advice from community experts and search the forums for help. Latest Fitbit News – Fitbit shares their latest announcements to keep their users up to speed. 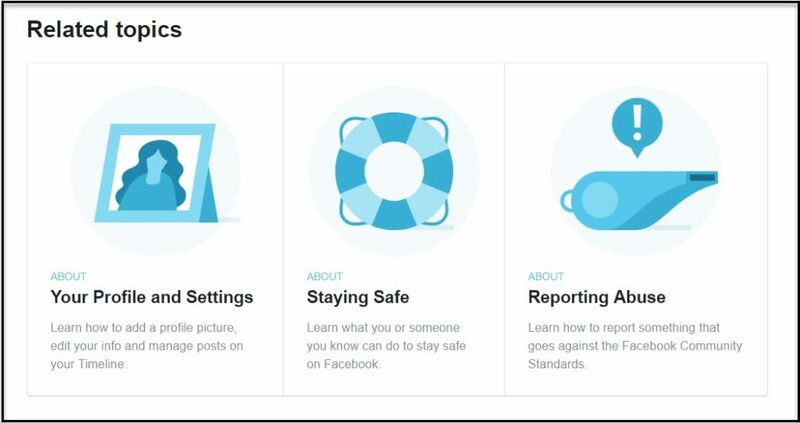 The take away from the Fitbit knowledge base is the visuals. Displaying visuals of the products immediately ensures users are starting their search for information in the right place. This makes it easy for people to navigate the site and fills visitors with confidence that the Fitbit Center will be able to help them. On the homepage of the Dropbox knowledge base is a link to its Twitter support page. This is an active Twitter page that posts recent blog articles, news, and other help related content. Importantly, it is monitored from Monday to Friday, so anyone with a question or problem can quickly receive help there. The community section is well managed by Dropbox, with a ‘Dropboxer’ team organizing and moderating all aspects of the content. Dropdown Categories Menu – Users can quickly find the info they need by searching an in-depth list of categories on the homepage. Featured Articles – Dropbox shares featured articles on the knowledge base homepage for users to easily access. 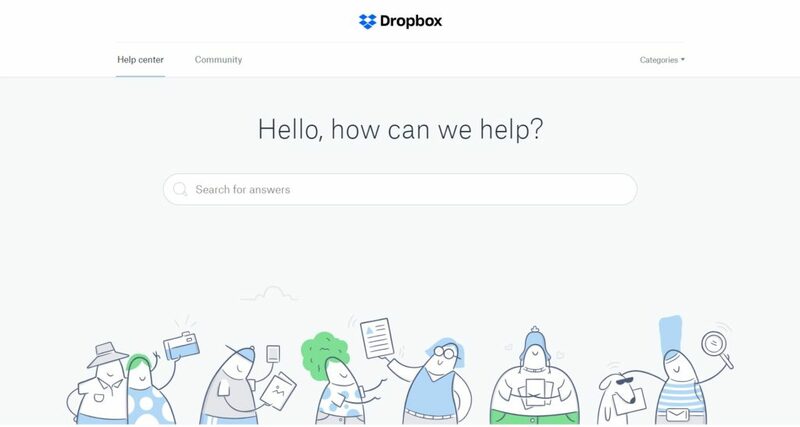 Get More Out of Dropbox – Top Tips for using Dropbox effectively are also displayed on the homepage for visitors to browse. Support is key to the Dropbox knowledge base, ensuring users are supported and can find the information they need quickly, and from a variety of resources. Square provides an uncomplicated, uncluttered, and easy to navigate knowledge base. Using cooling colors, mainly consisting of white, black, and grey with a bit of blue thrown in, this knowledge base will keep visitors calm and composed during their search for information. The Square knowledge base walks users through processes using numbered steps. This ensures readers can easily follow the instructions, and by breaking a task into clear manageable steps, it stops people becoming overwhelmed with excess content. Square displays a number of tables to help readers understand the differences between the services they offer. Displaying content in tables helps users quickly compare and contrast services, and make an informed decision on which option is best for them. Links to Further Information – Throughout articles, Square provides numerous links to other pages and articles containing related content. FAQs – Square provides a range of FAQs on different topics. ‘Note’ – Square displays extra information in the form of ‘Notes’ throughout articles. Simplicity is key for the Square knowledge base, with a firm emphasis on making content easily digestible for its users. Spotify is another action-packed knowledge base that provides a very user-friendly interface and is bursting with well-explained help-articles. Content is well organized, using lists and block colors to help the users eye easily browse the categories and articles. 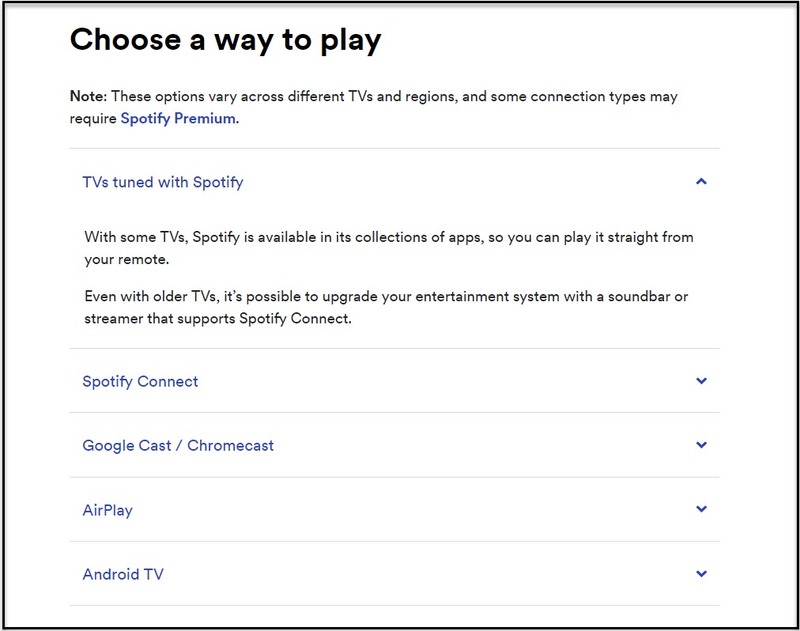 Many of the Spotify articles incorporate dropdown content within its articles. This is especially useful if you have a large amount of content to cover within one article. You can break the article into the main headings, so readers can see what is covered, and then access the info as they need it. The main benefit of using dropdown content is that the reader does not feel daunted by a deluge of information. Instead, they can just quickly jump to the content they need. Spotify embeds useful images, screenshots, and importantly, videos, into their articles. These add extra support to the content users are reading about, and also help engage those more visual learners. Well-positioned media, that is relevant to the topics being discussed, will greatly enhance your knowledge base and are a must if you want your support center to make an impact on customer experience. 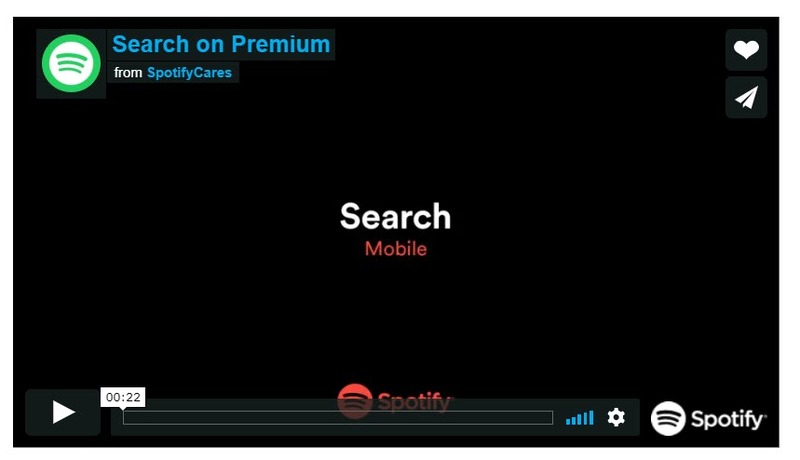 Bullet Points – Spotify uses bullet points repeatedly throughout their articles to help break up the content and ensure readers easily find the info they are looking for. Bold Text Colors – Text is broken up into categories and sections through the use of bold colors. Carousel of Useful Content – Spotify shows a carousel of useful and popular content on the knowledge base homepage, with links to supporting videos. Spotify is an extremely well laid out and organized knowledge base. All its elements, from colors to media, have a clear purpose, with no unnecessary features or clutter. 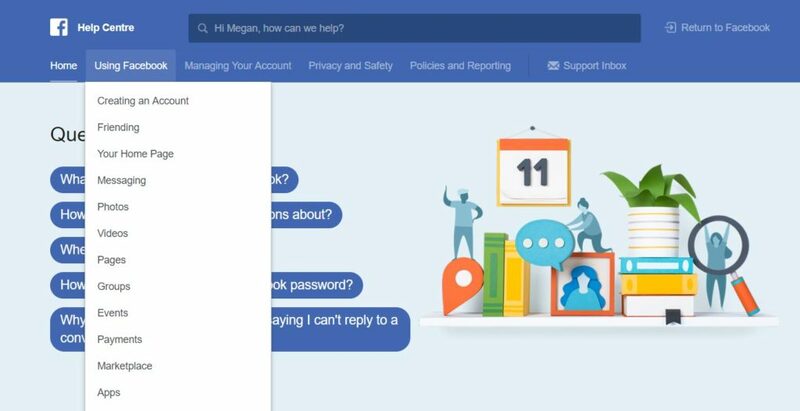 The Facebook knowledge center displays a large dropdown menu. Each menu title has a number of categories that can be viewed in a dropdown format when a user hovers over them. This dropbox menu feature helps organize the information and ensures users can easily find the category they need without having to open numerous new pages. Under each help-article, Facebook displays Related Topics. The related topics section usually consists of three links to other articles that are similar, or lead on from, the article that users are reading. This helps people easily find further information on the topic they are researching. Left-Hand Side Menu – Once a user opens an article, a further menu is displayed on the left-hand side of the screen. Numbered Steps – Facebook often breaks down instructional text into numbered steps to help users follow and act on the process being discussed. Feedback – Underneath each article, Facebook asks ‘Was this information helpful?’ If a user clicks No, Facebook then asks them a number of questions to ascertain why the article didn’t solve the user’s problem. This is useful feedback that can be learned from and used to improve the knowledge base content. Facebook also has a separate business knowledge base, covering all ad related content. This is a good idea if your business has a number of facets and is catering to different audiences. The Apple knowledge base is visually very impressive. Large, attractive full-screen width images occupy the featured image space of each page. And other attention-grabbing images break up pages, signpost categories, and add visual instructions that reflect the information in the text. But apart from aesthetics, what else does Apple do well? Apple posts weekly videos to its Apple YouTube channel. These videos provide how-to help, tips and tricks, and answers to recurring questions. Apple promotes its YouTube channel on the homepage of its knowledge base to encourage users to view this extra support. Apple asks their users to complete a survey to help them improve their knowledge base and other elements of customer support. This is can be an effective strategy to ensure that your knowledge base is meeting the needs of your customers. Footer – Apple displays all support categories in the knowledge base Footer. This provides yet another way for users to find the information they need. Contact Apple Support – Underneath each help-article, a link to the Apple Support department is provided, providing extra help to Apple customers if needed. Calls-to-Action – Hidden within the knowledge base are calls-to-action, upselling products like AppleCare to its users. As Apple is a global company, its knowledge base content varies slightly depending on the country or region customers are accessing it from. This may be an important point to consider if you are creating a knowledge base for a global business. Not only does Canva provide screenshots to support their articles, often the elements within the screenshots are numbered. This helps users identify exactly which features are being referred. In the instance above, numbering the elements helps readers become familiar with Canva Editor, giving them a greater understanding of this tool. Throughout articles, Canva provides Note sections. These sections are displayed mid article in a colored box, helping them stand out from the rest of the content. Here Canva displays helpful top tips on how to navigate the knowledge base, find information, and get further help. Search – The Search bar is displayed at the top of every page. So at any point, users can leave an article and search for a more relevant term. Proceed to Next Guide – The Canva guides run in order, so readers can build on their learning step by step. People Also Viewed – At the end of each article, Canva displays other articles under the heading of ‘People Also Viewed’, to try and help users find what they need. 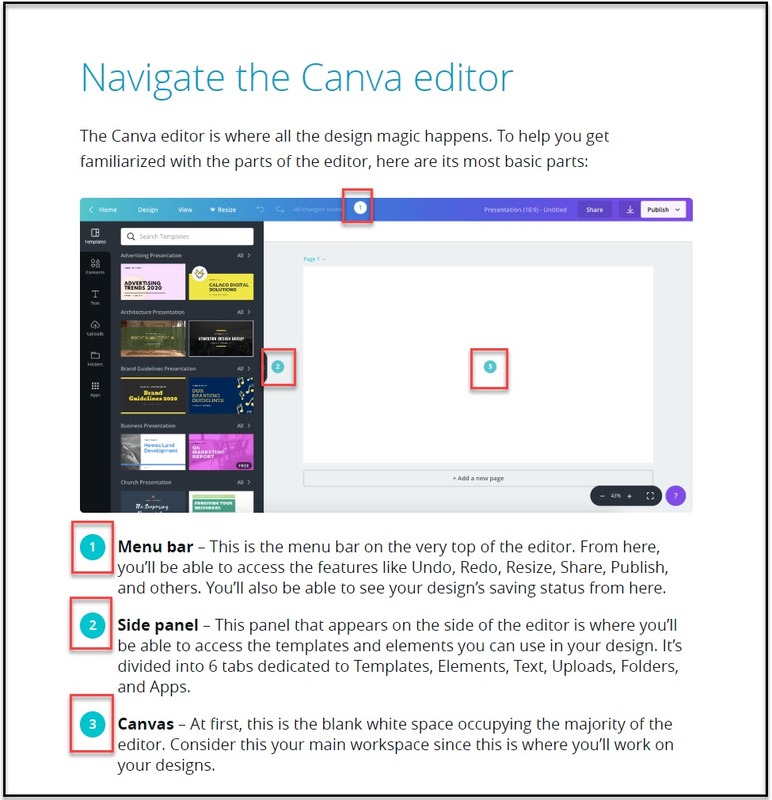 The Canva knowledge base is huge, providing visitors with guides, articles, how-tos, examples, and best practise. By providing inspiration as well as detailed help, the knowledge base excites people and encourages them to learn more about, and then extensively use, this tool. Creating a knowledge base isn’t an easy process. But from these ten impressive examples we have discussed, you should now have a good idea of the different features that a successful knowledge base needs. And importantly, which elements will work for the knowledge base you are about to create for your business. Are you ready to get started? Then check out HelpJet’s knowledge base software.